Sometimes, life gets in the way of knitting. Thankfully, all is well at chez TECH, but I need to now turn away for 6 weeks or so, and devote some significant time taking care of the non-bloggy parts of life. Despite my intentions, I may not be able to stay away from the blogosphere--you all are rather addictive! 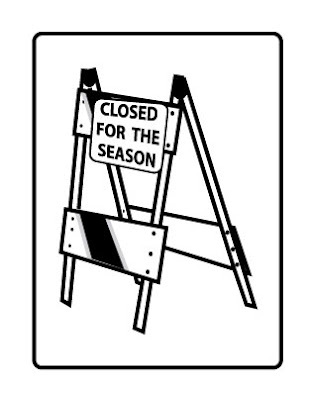 So, there may be a stray post or two between now and the beginning of September. Mostly, though, TECHknitting will resume right after Labor Day with new tricks and tips--including TWO NEW WAYS to do beautiful left-leaning decreases. See you all again in September. Until then, have a great summer, and knit on. Over the last several posts, this blog has laid before you three methods, each of which joins two colors of yarn AND works in the tails "as you go"
Which to use? As is usual in knitting (or life, for that matter) there are advantages and disadvantages--and you must make up your own mind. The Russian join is probably the least favorable--it's hard to make the join come out just where it should, ripping back to add stitches is very difficult, and this join is S*L*O*W.
The back join is more flexible than the Russian join, is faster, and accomplishes the same result. The back join can be modified so it is not quite as bulky as the Russian join. 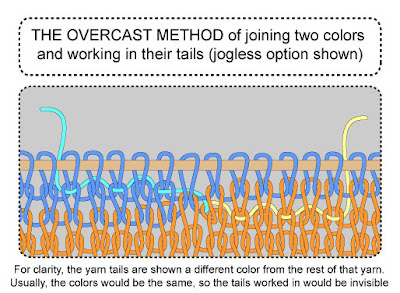 The overcast method is not bulky, and it is fast, but because the tails aren't folded into the fabric itself with the overcast method, there is less "friction" holding in the tails. The overcast method is not only more delicate-looking, it is actually more delicate--more likely to pull loose than the Russian join or the back join. I like the overcast method in a hairy, thin yarn, like a Shetland wool, (thanks, Ysolda for the link). In this sort of super-holding yarn, tails can be expected to get all the traction required to pin them down from the surrounding stitches, without having to be actually knitted onto the fabric face. And, for thin stripes in thin fabric, like socks, the advantage of not having doubled stitches on the fabric face outweighs the downside of the join being more delicate, at least to my mind. As the old folks used to say: "you pays your money, and you takes your choice" (but, a swatch will reveal much). The tension for the overcast method is adjusted afterwards, so the only real error you can make is if you accidentally knit a stitch using the tail yarn, instead of the standing yarn. If you DO knit a stitch using the tail yarn, you will NOT be able to pull on the tail yarn to adjust the tension, because the tail yarn will have been fastened down onto the fabric face--you'll have to rip back and do it over. The overcast method involves three steps. Its complicated, but worth it--see for yourself (illustration below)--the yellow tails belong to the orange yarn, the light blue tails belong to the blue yarn. 1. Knit the orange yarn to within some even number of the change point--to within perhaps 8 or 10 stitches in thin yarn, or perhaps within 6 or 8 stitches in heavy yarn. Loop the standing yarn over your tension finger so that the yarn coming from the work (the "working yarn") is in coming FROM BEHIND over your tensioning finger, and the yarn coming from the ball of yarn (the "tail yarn") is in front. 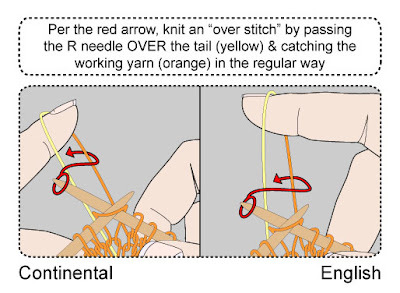 For clarity, the tail in the illustration is yellow, although, of course, in the real world the tail would be the same color as the working yarn (orange). It will be much easier to do the overcasting if you can figure out how to hold the tail firmly against the back face of the fabric with a stray finger or two--this will put tension on the loop of yarn and make all the following maneuvers easier. 2. (Below) Create the first part of the backward overcast, the "over stitch," as follows: with your right needle, reach OVER the tail yarn, then hook the working yarn in the usual manner, and make a stitch. 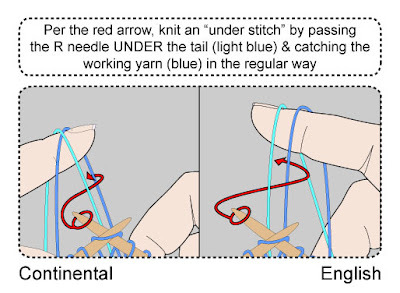 As the illustration below shows, the working yarn is wrapped over the tensioning finger from behind--the OPPOSITE from the way the yarn usually lies. As the illustration below also shows, the idea of reaching "over" the tail is pretty much the same idea as reaching "in front of" the tail. 3. 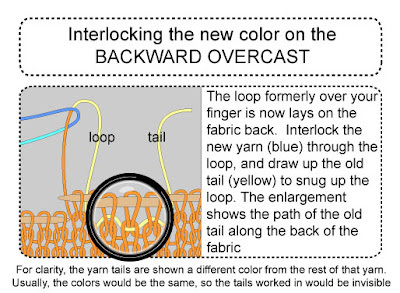 (Below) Create the second part of the backward overcast, the "under stitch," as follows: with your right needle reach UNDER the tail yarn (yellow), then hook the working yarn (orange) in the usual manner, and make another stitch. 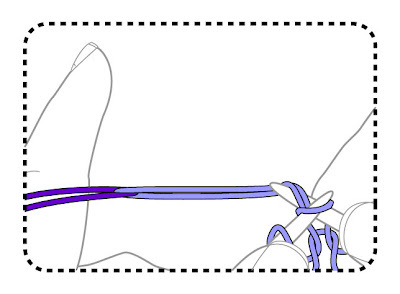 As the illustration below shows, the idea of reaching "under" the tail is pretty much the same idea as reaching "behind." 4. Repeat steps 2 and 3. As you run out of yarn in the loop over your tensioning finger, pull more yarn into the loop from the tail; again, the tail is not fastened down to the fabric face but only has stitches cast over it on the back. 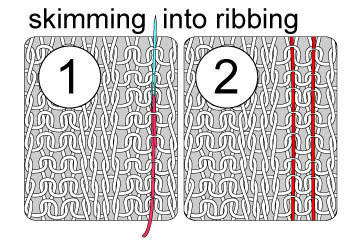 As shown in the illustration between steps 5 and 6, the tail yarn runs along the back of the fabric, free to slide back and forth--it doesn't slide easily, but it does slide. 5. When you get to the color-change point, you should have ended with an "under stitch." 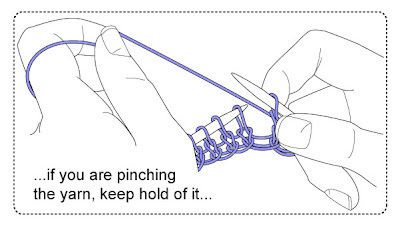 The remainder of the yarn you had over your finger will lay as a loop on the fabric back, as shown in the illustration below. 6. Interlock the new yarn (blue) with the old yarn (orange) by threading the blue yarn through the last loop of the old yarn. Pull out a nice long tail of the blue (several inches, at least) and leave it hanging on the back of the fabric. Again, for clarity, the blue yarn has been given a light blue tail, although, of course, in the real world both portions of the new yarn would be the same color, and the worked-in tails would be invisible (as they are in the opening photo illustration of this post). 7. Pull the tail of the old yarn carefully to tighten, until the last orange loop over the right needle has the same tension as the rest of the orange stitches and the blue is snug against the back. This completes the backward overcast sequence. 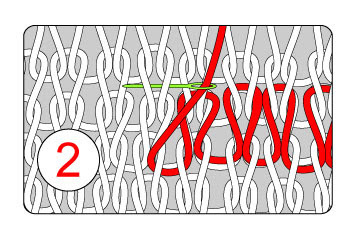 As shown in the illustration between steps 5 and 6, the tail of the old yarn (yellow) is now held down on the fabric back by the over-and-under action you did as you knit the last several stitches of the orange yarn. The next phase of the work is to work one round plain in blue. Therefore, leaving the light blue tail dangling on the back of the work, work one round in blue. 2. (below) You will now create the first stitch of the forward overcast sequence on the next stitch presenting on the left needle. (If you did select the jogless option this would be the SECOND blue stitch. If you did not select the jogless option, this would be the FIRST blue stitch. 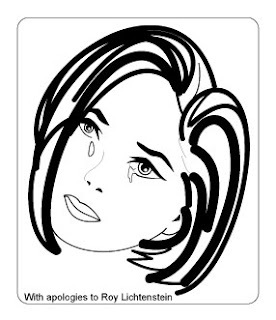 For comparison, the illustration below is NOT jogless, the second illustration of this post--above--IS jogless.) Take the tail of the blue yarn into your yarn-feeding hand, and, using a spare finger or two, anchor the tail so it is in front of the standing yarn (standing yarn-yarn coming from ball). Again, for clarity, the tail is illustrated in light blue, although in the real world, the tail and the standing yarn of the ball you are adding would be the same color. Now, just as with the backward overcast, use your right needle to reach OVER the tail yarn (light blue) then hook the working yarn (blue) in the usual manner, and make a stitch. 3. (below) Create the second stitch of the forward overcast sequence as follows: with your right needle reach UNDER the tail yarn, then hook the working yarn in the usual manner, and make another stitch. 4. Repeat steps 2 and 3 until you've overcast the tail by about the same number of stitches as you overcast the tail in the backward sequence. In other words, if you worked 8 stitches over-and-under the tail with the backward sequence, work 7 or 8 stitches over-and-under the tail with the forward sequence. After these stitches are worked, drop the tail and continue knitting onwards with the standing yarn. At a good stopping spot, re-adjust the tail tension. The forward overcast usually needs less adjustment than the backward part of the overcast. In the forward overcast, the tail is not part of the same loop as the working yarn, so you will not have had any problem running out of yarn--there will have been no need to slide tail yarn into the loop around your finger. The backward overcast will need more attention, because you will have scrunched up the fabric somewhat by sliding the tail yarn under the overcast stitches to deliver more yarn to the loop over your finger, and then scrunched it back the other way when snugging up the interlock. 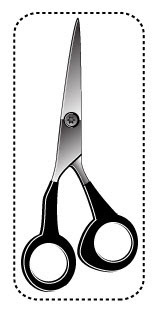 Therefore, be sure to stretch the fabric back and forth over a fingernail to smooth out the fabric and evenly distribute the tail, especially on the backward overcast portion. Snip the excess of the tails off, leaving 1/4 to 1/2 inch hanging. Make up the garment and block it, re-adjust the tension of any loose join one more time, then clip the excess of the tail even with the back of the fabric. As is evident, the thinnest stripe you can make this this method is 3 rounds high--any narrower and the backwards overcast of the old color would run right into the forwards overcast of the new color. If you MUST have 2 round high stripes, skip the intermission step, and simply work the forward overcast on the same round as the backward overcast. Also: if you choose the jogless option as it is written here, you will create "traveling" jogless stripes. For more information, or to modify the work to "stationary" jogless stripes, click here. 1. If you mistakenly do an "over" where you should have done an "under," or an "under" where you should have done an "over," it really does not matter. You can even end on an "over" instead of an "under," like you're supposed to, and that doesn't really make a lot of difference, either--your loop will lay a little crooked, that's all. In fact, the only REAL error is to mistakenly knit with the tail yarn, instead of casting over it. You can test for that error by giving your tail yarn a little tug after each over or under stitch. If the tail moves, you're still on the right track. If it doesn't, tink back to where you mistakenly knitted the tail onto the fabric surface and do it again. 2. The fact is, that even though the instructions say to do it, and even though that's the way it is illustrated, I personally do NOT wrap the yarn over my tensioning finger "backwards" (tail in front) when I do the overcast. I leave it looped on the regular way (tail in back). I show it different than I do it because experience dictates that its easier to LEARN (and illustrate!) the overcast with the tail yarn held in front. Once you get the hang of the overs and unders, you'll have no trouble adapting to do the overcast method with the yarn wrapped the regular way over your tensioning finger. And of course, once you gain the experience to overcast from a regular wrap position, you can do the overcast method at pretty much the same speed as you knit--it might take a bit to get that fast, so hang in there. To work the overcast method in back-and-forth knitting, you work the backward overcast on the last row of the old color, as you get within 6 or 8 stitches of the end of the row. You switch yarns at the edge by looping the old yarn through the new yarn, as illustrated above, and then you work the tail of the new yarn into the next row by the forward overcast. If you like, you can reduce bulk by separating the two overcast rows--work the first row of the new color plain, and work another backward overcast to work in the tail of the new color as you come within 6 or 8 stitches the color change spot on the second row of the new color. If you find you are having trouble with the concept here, you may want to practice your "overs and unders" with a very similar sort of work--called the disappearing loop method for casting on. Rather than messing with your knitted fabric, practising the disappearing loop only requires a few inches of yarn. While the action is not exactly the same, if you master the overs and unders of the disappearing loop, you'll be miles ahead on the overcast method. 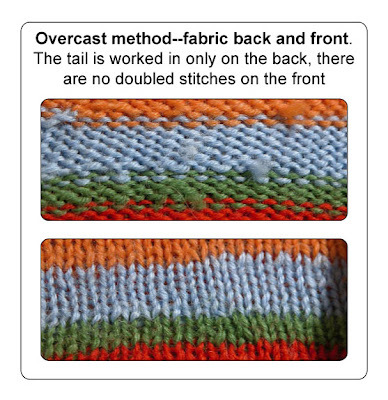 The back join (subject of a previous post) is a method for working in the tails AS YOU GO in multi-color knitting. The back join is NOT confusing, but judging from the e-mails in the TECHknitting in-box, the first post about it WAS confusing. 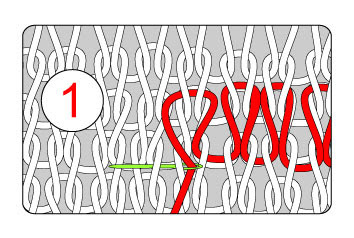 It would be a pity to obscure such a useful technique with badly-written instructions, so here's another run at it--with an additional illustration showing the back join as it is being knitted. The back join is usually used in circular knitting (around and around) because back-and forth knitters usually change at the fabric edge. Therefore, the illustrations below show the back join in circular knitting. You can, however, do the back join in flat (back and forth) knitting--see number (8), below. So, suppose you are knitting around and around on circular needles in LAVENDER and you want to switch to PURPLE. One vital piece of information you'll need to figure out is EXACTLY where you want the color change to be. The first two steps in the illustrated instructions below are MEASURING steps. As you get better at the back-join, you can skip steps 1 and 2, but for the first few times, it probably makes sense to go through all the steps. 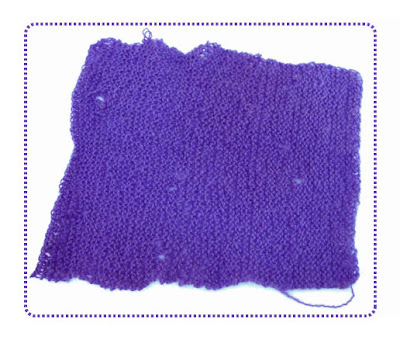 1) (above) Begin the back join by knitting to the last LAVENDER stitch. Now you need to somehow locate and mark the spot on the tail, just PAST this last lavender stitch. This is the spot where you will interlock your lavender and purple yarns in step 3. 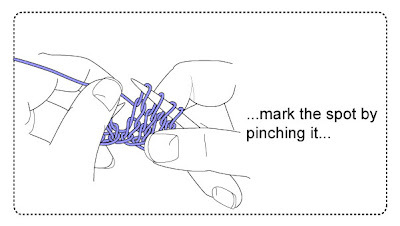 You can mark this spot with a pin or a paperclip, or you can mark the spot by pinching it--the illustration shows the spot being marked with a pinch. 2) (above) Once you have this spot marked, UNRAVEL the last three stitches you have knit, and RETURN the unraveled stitches to the LEFT NEEDLE. 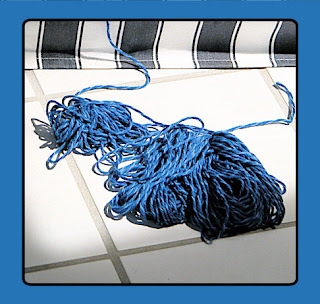 If you are pinching the yarn to make the spot, you have to keep hold of the spot as you unravel. If you are marking the spot with a pin or clip, you do not have to keep hold of the spot as you unravel--the pin or the clip remains in the tail to mark the spot. 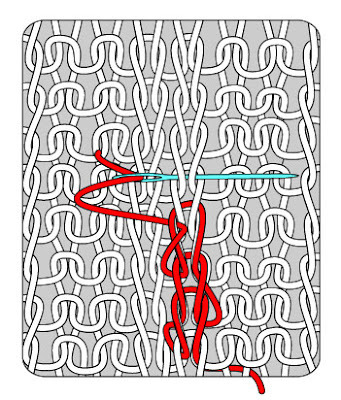 The illustration above shows the three last stitches already unraveled, and returned to the left needle. 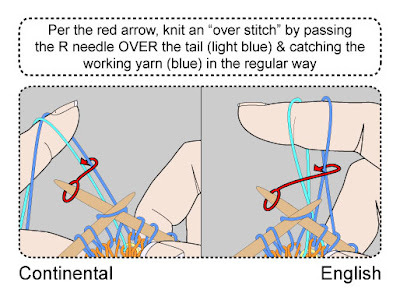 The knitter in this illustration chose to mark with a pinch, and therefore is keeping hold of the spot to mark it. 3) (above) In step 3, you will INTERLOCK the old color (LAVENDER) with the new color (PURPLE) at the spot you have previously marked. You do this by folding the PURPLE yarn over the LAVENDER yarn at that spot. 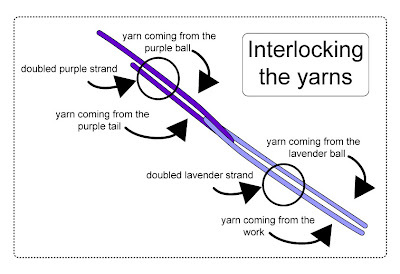 The LAVENDER yarn is now folded back on itself, creating a doubled strand--one strand is the yarn coming from the work, the other is the strand going to the ball. The PURPLE yarn is also folded back on itself, and again, a doubled strand is created, with one strand of yarn coming from the ball of purple yarn, and the other strand being the tail--which you should leave plenty long--several inches, at least. 4) (above) Anchoring the LAVENDER end of the interlocked strand up against the fabric with your right hand, and anchoring the PURPLE end of the interlocked strand over your tensioning finger, re-knit the next three stitches. Because the LAVENDER portion ends at the very spot you have marked, and because this spot is just past the last of the three re-knit lavender stitches, your color change should wind up exactly where it ought to be. (If the color change ISN'T where it ought to be, just unravel, and move the interlock.) 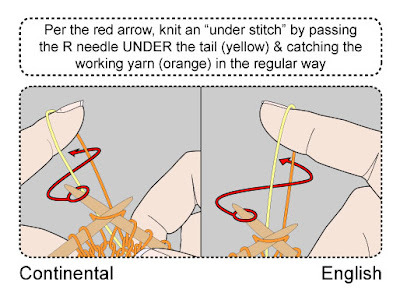 The illustration above shows a continental-style knitter with the interlocked doubled strands of yarn wrapped over the left forefinger, but an English-style knitter would do everything the same, only just wrap the interlocked doubled strands of yarn over the right forefinger. 5) (above) After re-knitting the 3 LAVENDER stitches, the interlocked yarn automatically will be at the doubled PURPLE strand, and you will knit the next three stitches with both strands of the purple. After three stitches, drop the purple tail, and continue to knit normally with a single strand of purple yarn. When you get to a good stopping spot, separate the lavender yarn from your work by snipping it free, leaving an excess tail of a few inches on the back of the work. 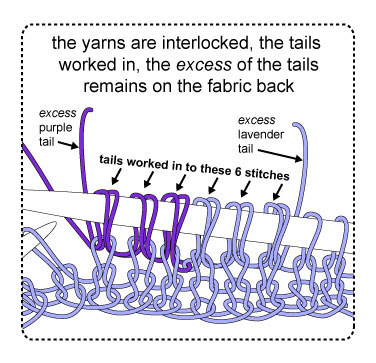 The illustration above shows the result after the six stitches of interlocked yarn have been knit, the tails themselves are worked in, and the excess of both tails have been left on the back of the fabric. Because the tails have been doubled BACK on themselves, this join is called the BACK JOIN. IMPORTANT NOTE: When you get to the color change spot on the next spot, do not be confused by all the doubled stitches--knit only 1 stitch into each doubled-strand stitch in the round below--you should get 6 stitches in this area, not 12. 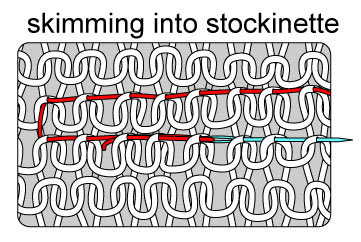 This is the same situation as when tails are anchored with an overlapping join in single-color knitting. 6) As stated above, the more you use the back join, the better you'll get at it. Pretty soon, you'll be able to completely skip the measuring steps of knitting, marking and unraveling (steps one and two) because you'll have gained a pretty good idea of just where the interlock should occur. In other words, as you gain experience, you'll be able to start the process from step three -- you'll be able to interlock in the correct spot without having to stop and measure first. 7) After you have made up and blocked the garment, you do not need to work the excess tails in any further--the actual tails are already worked into all those doubled stitches. Simply snip the excess of the tails about 1/4 or 1/2 inch from the back face of the fabric and leave them there. If the garment is woolen, then after another couple of washings, any excess tails which haven't matted themselves onto the back fabric face may be clipped off short. If the garment is made of cotton, acrylic or any other "slippery" yarn, you are probably better off just leaving a short length hang on the fabric back for all time--less chance of having the excess of a tail pop through to the fabric face as you move and stretch. 8) If you want to do the back-join in flat knitting (back and forth on two needles), or if you want get fancy and reduce the bulk of this join, or if you want to combine this join with the "jogless join" technique, there is information about how to do all three of these things at the original back-join post. I apologize to those of you I confused the first time. Hopefully this version of the instructions will be easier to follow.